That's the City Hall across the street. They could put some neon on it . . . I am guessing that the meter is in the cabinet on the side and it is feeding the service entrance conductors to the roof where the service head used to be located. In the mid-late '70s, SoCA Edison did some overhead to underground utility changes. This was the method that was used for some of them. It's on the utility's side, so isn't subject to the NEC or the City's Inspectors. (The very first picture I sent to ECN was of one of these. I found a whole forest of them up in LA county). 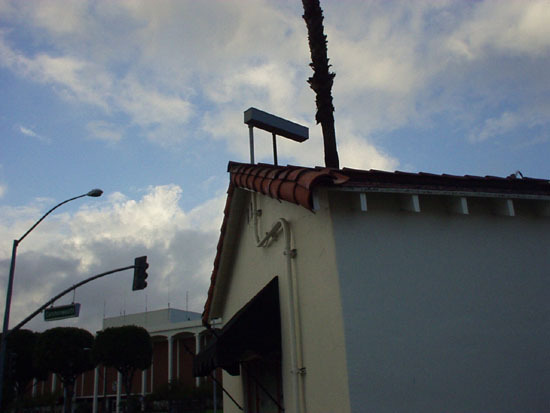 A 3' section of 6X6 NEMA 3R wireway was "mounted" atop of the old service risers, and the new UG was fed up to the gutter. These are just sitting on top of the conduits, concentric knockouts and all. The box on the outside contains only the landing lugs for the UG. 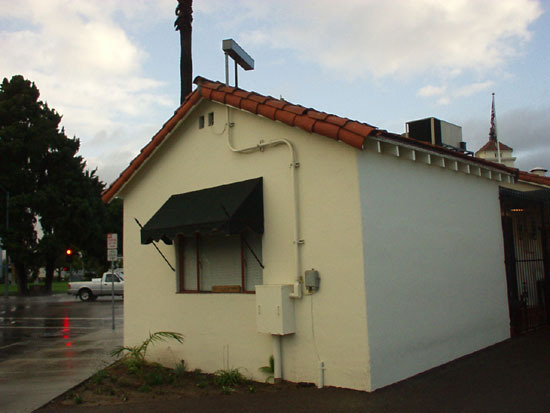 The meter is actually inside the little building, which was built around 1920. Maybe we could dress it up to look like an airplane...or a locomotive... or even the pirate ship from Peter Pan. Being that the gutter is “flying,” I would consider it my civic duty to install a complimentary FAA L-810 obstruction light on the gutter.